We have more data and information in our lives than ever before, and keeping track of it in a safe and secure manner has become imperative in our modern lives. If you’re looking for a way to keep all of your personal information with you on-the-go, but still want to feel confident that it remains secure even if you lose the device, then Password Genie may be the Android app you need. Password Genie is free, and includes a 30 day trial, but to continue the coverage you need to buy the full coverage for a year, but it will only set you back $5.99 for some pretty great features. Try to name off all of the passwords you need to keep track of on a daily basis, or even on a weekly basis. Chances are you named at least a dozen, and that’s if you even remembered all the things you need to access. Plus, there’s all the information you need to access throughout the month that’s easily forgotten, simply because you don’t access it every day. Here’s a few bits of information, just to see how your list compares: credit cards, bank cards, savings accounts, investment accounts, frequent flyer miles, garage codes, insurance information, prescription information, hotel cards, travel information, pin numbers…you probably get the point by now. There’s a lot of things to remember, and for most of us things simply aren’t brought to mind unless they’re wrote down. That’s where you come to the kicker, how do you keep that information safe once you’ve wrote it down? This is where Password Genie for Android, from developer Security Coverage Inc, really shines, and that’s by not only keeping all of your personal information in your pocket but also by keeping it safe at the same time. Password Genie is an Android app that uses industrial strength encryption and security, accessed only by you through your personal pin number. Now, instead of remember dozens or even hundreds of bits of information, you simply keep a single pin number. You don’t even need to worry about leaving your phone in a restaurant with the app open, because even after bringing the phone out of stand-by your pin is required again to access the information. Of course none of this would be convenient if your information was easily accessed at the same time. 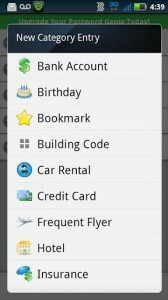 Password Genie does a good job of helping keep all of your stored information well categorized. Not only can you select from an extensive category list when you add your information, you can also create custom categories to match your requirements. 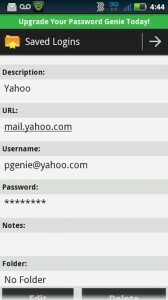 It would be easy to think of Password Genie as just a password locker, but in reality it functions as so much more. You can use the app as a mobile wallet, password manager, and even personal organizer. 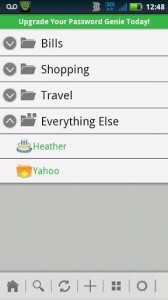 Track your family and friends birthdays, keep all of your username and passwords together, even synchronize with a desktop version of the app, though there is an additional fee for that software. It’s not all perfect, but the caveats are fairly minor. You can enter other items for tracking as well, like books and movies, but entering that information on your smartphone gets tedious fairly quickly. Also, when you open the app you are presented with four boxes for your pin number, but not the keyboard to type it in. Instead you have to touch the first block to bring up the board, and it’s the full board instead of just a numberpad. 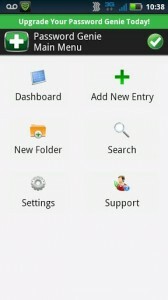 Overall, Password Genie is an impressive Android app that brings together a lot of great features. If you’re looking for a way to safely and securely keep all of your information on you for quick access, then Password Genie is a must have app. 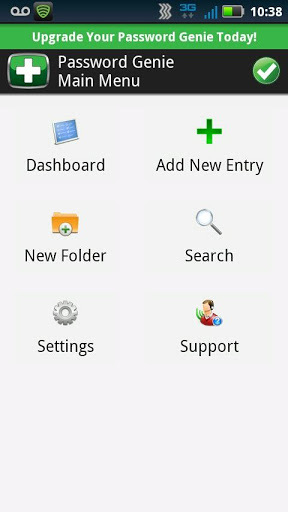 Password Genieis compatible with Android 2.1 and up. Version used for review was 3.4.20120829.A small expedite fee was paid by the developer to speed up the publication of this Android app review.